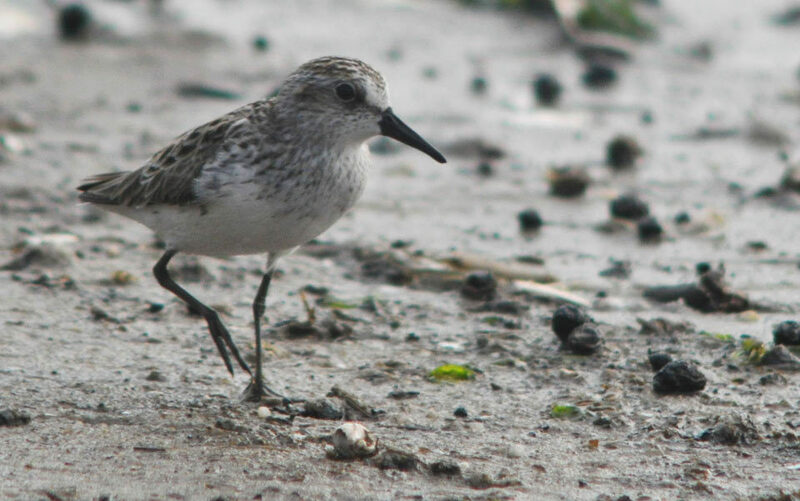 I met my first semipalmated sandpiper in a crook of Jamaica Bay, an overlooked shore strewn with broken bottles and religious offerings at the edge of New York City. I didn’t know what it was called, this small, dun-and-white bird running the flats like a wind-up toy, stopping to peck mud and racing to join another bird like itself, and then more. Soon a flock formed, several hundred fast-trotting feeders that at some secret signal took flight, wheeling with the flashing synchronisation that researchers observing starlings have mathematically likened to avalanche formation and liquids turning to gas. Entranced, I spent the afternoon watching them. The birds were too wary to approach, but if I stayed in one spot they would eventually come to me. They followed the tideline, retreating when waves arrived, and rushing forward as they receded, a strangely affecting parade. When they came very close, their soft, peeping vocalisations enveloped me. That night I looked at photographs I’d taken, marvelling as the birds’ beauty emerged from stillness and enlargement, each tiny feather on their backs a masterpiece of browns. I looked up their scientific classification, Calidris pusilla, conversationally known as the semipalmated sandpiper — a name derived from a combination of their piping signal calls and the partially webbed feet that keep them from sinking in the tidal sand flats of their habitat, where they eat molluscs, insect larvae and diatom algae growing in shallow, sun-heated seawater. I learned that semipalmated sandpipers are the most common shorebird in North America, with an estimated population around 1.9 million. My copy of Lives of North American Birds (1996) described them as ‘small and plain in appearance’, which seemed unappreciative, especially in light of their migratory habits. Small enough to fit in my hand, they breed in the Arctic and winter on South America’s northern coasts, flying several thousand miles each spring and fall, stopping just once or twice. The flock I’d watched was a thread in a string of globe-encircling energy and life, fragile yet ancient, linking my afternoon to Suriname and the tundra. At that fact, I felt the sense of wonder and connection that all migratory birds inspire. Yet not once did I wonder what they thought and felt along the way. How did they experience their own lives, not just as members of a species, but as individuals? It was a question outside my habits of thought, and occurred to me only months later, when I interviewed the American artist James Prosek. His compendium Trout: An Illustrated History (1996) had earned comparisons to the great American ornithologist and painter John James Audubon. Prosek’s paintings are indeed beautiful and his book, published while he was still an undergraduate, was shaped by a tradition of field guides and natural histories. Prosek had not personally encountered many of the trout and salmon species that he painted. Instead, he accepted on faith their place within established taxonomic classifications. But those classifications would soon be rearranged by the application of molecular genetics to the taxonomy of the salmonids, a rearrangement that encouraged Prosek’s deepening appreciation for how varied fish of the same species or subspecies, or even the same watershed, could be. The field guide notion of a species ‘type’ felt inadequate, even misleading. Prosek’s contemplations culminated in the glorious paintings of his latest book, Ocean Fishes (2012): he made a simple but profound decision to paint the specific, individual fishes he encountered. The Linnaean system of classification — a hierarchical naming structure introduced by the Swedish botanist Carl Linnaeus in 1735 — might describe the world and its generalities, implied Prosek, but it could not capture the richness of an individual life. Several months after meeting Prosek, I was walking in Jamaica Bay on a bitterly cold and cloudless day when I saw semipalmated sandpipers again, running ahead of a pounding surf that caught the afternoon sun and sprayed their retreats with prisms. As Elizabeth Bishop observed in her poem ‘Sandpiper’ (1955): ‘The roaring alongside he takes for granted,/and that every so often the world is bound to shake.’ I wondered what it would be like to be one of them, to run with the flock and feed in the surf, to experience life at their scale and society. Simply put, did they enjoy it? Were they cold? Did they remember their journeys, feel a connection to individuals with whom they’d flown, a concern for compatriots and mates? Asking those questions made me appreciate just how deeply I’d internalised the taxonomic system against which Prosek strained, as well as the habit of explaining animal behaviour in mechanical terms. I’d regarded the sandpipers as embodiments of their species and life history, but not as individuals, much less as selves. This oversight was not coincidental. The very history of taxonomy and attendant studies of animal behaviour is intertwined with a denial of individual animal consciousness. Scientific taxonomy began not in the 18th century with Carl Linnaeus but some 2,000 years earlier in ancient Greece, with philosophers who venerated rationality and the power of language. Before them, and especially during humankind’s long prehistory, animal deaths at our hands might have been necessary or justifiable, but they were also seen as unfortunate, and we offered thanks and apologies, as evidenced in paintings, artifacts and ritual. The most rationalistic of Greek thinkers washed their hands of such sentiments. Aristotle introduced the notion of binomial nomenclature, grouping animals by whether or not they had blood, and whether they lived on land or in water, in a hierarchy with humans at the top. In his view, animals were incapable of any sensations but pain and hunger. Brutal as this sounds, Aristotle was practically an ancient Peter Singer compared with the Stoics such as Zeno of Citium, who insisted that animals felt nothing at all. This view influenced early Christian thought and, eventually, René Descartes, according to whom animals were all body and no mind, no different from the lifelike mechanical toys popular in 17th-century France. Descartes’ influence is manifest in the infamous words of the French rationalist Nicolas Malebranche, who said in The Search After Truth and Elucidations (1674) that animals ‘eat without pleasure, cry without pain, grow without knowing it; they desire nothing, fear nothing, know nothing.’ Not everyone agreed. Notable critics included Thomas Hobbes, Spinoza and Voltaire, but their objections held little sway in an era of triumph for mathematics and the physical sciences. It was an intellectual moment most unfavourable to what could be felt but not quantified. Thus beliefs about animals that would be considered psychopathic if acted out by a 21st-century child became tenets of Western scientific thought and, in this milieu, taxonomy as we know it took form. The science of taxonomy was driven by wonder and new discoveries in faraway lands, but this was not the whole of it. As Michel Foucault notes in The Order of Things (1966), people had always been interested in plants and animals. What taxonomy satisfied was not simply curiosity but a desire for an overarching order to the world. Linnaean classification was triumphant among dozens of competing, lesser taxonomical schemes, but they all served a common project of bringing nature’s wild diversity to Enlightenment heel, of putting the messy living world in tabular form. Linnaeus did have an extraordinary eye for detail, and combined his supreme ambition with a simple and powerful system for classification. It worked by comparing a few clearly visible, easily measurable anatomical traits: his natural history was based purely on surfaces. A century later, the French naturalist Georges Cuvier revolutionised taxonomy by introducing comparisons of internal anatomy, but, as far as the inner lives of animals went, this too was a superficial revolution. It was a science of gross anatomy, not of minds, reflecting Descartes’s mechanistic image of animals as assemblages of pieces. By the time of Cuvier, science had an entrenched species-first filter through which nature would be scientifically and culturally apprehended. Taxonomic science was far, however, from arbitrary. It was, and is, a wonderful means of describing the variations that do exist in the natural world. 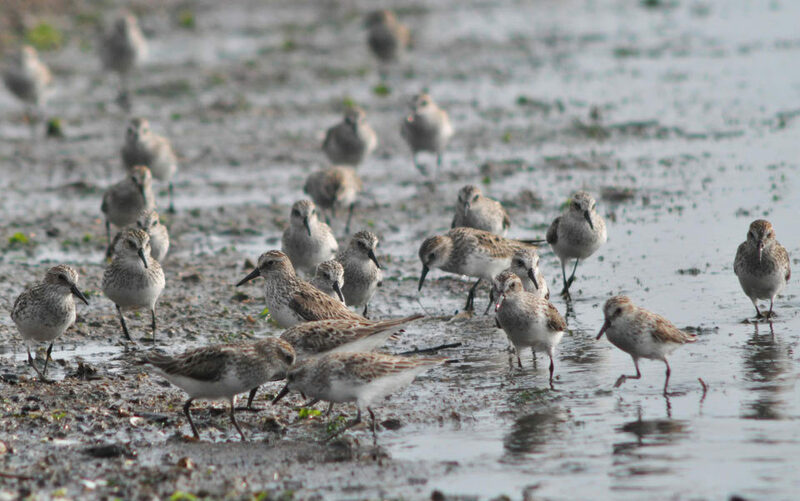 Taxonomy – or modern-day systematics – provides a language with which it is possible to understand the sandpipers in that crook of Jamaica Bay as being part of a related group including oystercatchers and common terns. With that language, it’s also possible to note that semipalmated sandpipers can live for more than a decade, take mates in monogamous relationships that may persist for years, eat a lot of horseshoe crab larvae while migrating, and have declined in population by roughly one-third since the 1980s. Most importantly, taxonomy was a scaffold upon which evolutionary theory could be built. Although Linnaeus had believed the variation among animals was an immutable arrangement and divinely apportioned, evolutionary thinkers realised that these were family resemblances, to be elucidated more than a century later by Charles Darwin. And the great beauty of evolution, its essential profundity, is in placing humans among animals, not only in body but in mind. By emphasising the kinship between animals and human beings, Darwinian taxonomy could have opened the door to thinking about the consciousness of individual animals. But, instead, the opposite happened. Even as evolution’s mechanics were accepted and expanded, the views of Darwin and Romanes on individual animal consciousness were rejected, consigned to cautionary tales of how even the most brilliant scientists can get things wrong. By the 1940s, when the great systematist Ernst Mayr settled on a fuzzy but useful standard definition of a species — as a population with a common reproductive lineage that could interbreed — the possibility of animal consciousness and individuality, so evident to anyone with a pet dog or cat, was largely eliminated from mainstream science. We could accept our animal bodies, and classify ourselves on that basis, yet had to avoid the implication that animals might have human-like minds. A new age of machines and industry spawned the behaviourism of the psychologist B F Skinner who, echoing Aristotle and Descartes, proposed that animals were nothing but conduits of stimulus and response (as were humans). Seeming evidence of higher thought was an illusion produced by some simpler mechanism. It’s true that behaviourism helped to establish protocols by which animal cognition could eventually be studied in rigorous, scientifically acceptable fashion. But the price was steep: decades would pass before scientists began to allow that some animals might be more than biological automata. In the 1960s, Jane Goodall was mocked by her primatologist peers for speaking of chimpanzee emotions, such as a mother grieving for her dead infant. Even her use of gender-specific terms for individual chimpanzees was seen as anthropomorphic and unscientific. As the journalist Virginia Morell recounts in Animal Wise (2013), Goodall’s editor at the prestigious journal Nature tried to replace ‘he’ and ‘she’ with ‘it’ in her first manuscript. When the zoologist Donald Griffin wrote in The Question of Animal Awareness (1976) that biologists should investigate ‘the possibility that mental experiences occur in animals and have important impacts on their behaviours’, it was still a radical suggestion. These days, Goodall is a hero, Griffin a prophet, and studies of animal intelligence ubiquitous: not just in chimpanzees, dolphins and parrots, but in octopuses, archerfish, prairie dogs and honeybees — a veritable Noah’s Ark of braininess. Caveats remain, of course. Intelligence is relatively easy to study, but it isn’t quite the same thing as consciousness, nor emotional life. It’s been less controversial to ask whether rats remember where they stored food than whether one rat cares for another. Yet even rats, it turns out, feel some empathy for one another. A team at the University of Chicago found that rats became agitated when seeing surgery performed on other rats, and a follow-up study in 2011 found that, when presented with a trapped labmate and a piece of chocolate, rats free their caged brethren before eating. Those who study animal behaviour are still careful when talking about subjective experience — sure, Eurasian jays can guess what their mates want to eat, but who knows if they like each other? — but they’re being professionally cautious rather than dismissive. The average person can safely speculate away: animal consciousness is a reasonable default assumption, at least for vertebrates, and not just in some dim sense of the word, but possessing forms of self-awareness, empathy, emotion, memory, and an internal representation of reality. Many of the characteristics thought to be important for higher consciousness (such as brain size) and a sense of individuality (in humans and — maybe, just maybe — a few other great apes and cetaceans) aren’t so unique anymore, or are no longer considered very important. Features such as working memory and episodic memory — keeping multiple pieces of information in mind and remembering what has happened, the cognitive fundaments of conscious experience — appear to be widespread. And the environmental challenges that might prompt the evolution of consciousness are widespread, too. Among these is sociality: if you’re going to live with others, it’s very useful to be conscious of them. And the distinction between cognition and emotion is increasingly seen as a false one: certainly in humans, they are more or less inseparable systems. Those other creatures likely include a great many reptiles, amphibians and fish. They tend to be underappreciated because they’re even harder to study than mammals, birds and octopuses, and seem, well, a bit inscrutable. Consciousness is necessary to be an individual, to have unique thoughts and feelings rooted in one’s own experience of life — and the animal kingdom teems with it. Many scientists still don’t know this, or don’t accept it. The whale biologist Shane Gero is part of a research team that has conducted long-term sperm-whale studies off the island of Domenica in the Caribbean. These studies describe the dynamics of whale families in which children are, in a very real sense, the centre of their lives. Yet Gero told me of being chastised by colleagues for referring to animals by name rather than number. Pressure still exists to think not of individuals, but of general species traits that happen to be manifested in a particular animal. Gero has helped to decode the vocalisations that sperm whales might use as names, something that’s also been observed in dolphins, but this remains controversial. That’s why a visitor to the ‘Whales: Giants of the Deep’ exhibition at the American Museum of Natural History in New York can learn a lot about their skeletons, heart capacity and navigational abilities, but barely anything about their intelligence and social lives — arguably the most dynamic area of contemporary cetacean research. Not surprisingly, the science of animal personality is still young. Recognition of animal consciousness might be just a first step. Individual differences based on temperament and experience, again so obvious to pet owners, is a new idea in science. For sperm whales, says Gero, such differences were once dismissed as statistical noise or evidence of behavioural maladaptation. The blind spot is hardly restricted to whales. The article ‘Energy metabolism and animal personality’ published in the journal Oikos in 2008 pointed out that ‘personality will introduce variability in resting metabolic rate measures because individuals consistently differ in their stress response, exploration or activity levels….’ Animals that have ‘frozen’ with fear during capture might be misclassified as having high resting metabolic rates, when in fact a motionless rabbit with his heart racing might simply be scared. What might it mean to treat all vertebrates as having some form of consciousness and individuality? Animal welfare advocates campaign for the better treatment of companion and farm animals, which is a noble cause. But I am more interested in wild animals, our neighbours in nature. To the painter James Prosek, seeing wild animals as individuals offers a new and sorely needed conservation ethos. Biodiversity and ecosystem services make for well-meaning but often uninspiring rhetoric; they value nature generally, but provide little reason to care for actual creatures in a nearby forest or your backyard. Acknowledged as individuals, those sparrows, salamanders and squirrels are not interchangeable parts of a species machine. They are beings with their own inner lives and experiences. Does this mean we should never eat a salmon, or cut down a tree to build a house? Not necessarily. We might simply acknowledge the consequences of our actions, and offer apologies and thanks to those creatures we affect. It’s the sort of ethical equation people need to solve for themselves. For myself, I’d be happy to see a revival of naturalist language, the sort of charming, unapologetically anthropomorphic descriptions one finds in old field guides, written before the ascendance of the 20th century’s airless, specialist vernacular. It’s a voice heard in The Birds of Essex County, Massachusetts (1905) in which Charles Wendell Townsend described a ‘low, rolling gossipy note’ voiced by semipalmated sandpipers approaching other birds. He waxed eloquent about their courtship, the male ‘pouring forth a succession of musical notes, continuous wavering trill, and ending with a few very sweet notes that recall those of a goldfinch… one may be lucky enough, if near at hand, to hear a low musical cluck from the excited bird. This is, I suppose, the full love flight-song.’ It is the language of a man who cares. And what of the semipalmated sandpiper, a few of which I last saw at low tide on Labor Day? Is it appropriate to use words such as gossip and love, to think of their self-awareness? I put the question to the British ornithologist Tim Birkhead, whose latest book is Bird Sense: What It’s Like to Be a Bird (2012). He told me he couldn’t recall any behavioural tests of sandpipers, nor rigorous comparisons to crows or parrots, but still, he said: ‘You can guess that they have more sophisticated cognitive abilities than most people would give them credit for.’ Given everything we know about animal consciousness, and the primal nature of both our own emotions and our social bonds, it certainly seems reasonable to err on the side of personalising the birds. Birkhead told me an anecdote about a red knot — Calidris canutus, a close relative of the semipalmated sandpiper — found injured in 1980 on the north Dutch coast by a middle-aged couple. Jaap and Map Brasser named him Peter and nursed him to health. Peter never flew again, and lived with the Brassers and their dog Bolletje for nearly 20 years. Each afternoon he received half a loaf of bread, not so much to eat as to peck; Peter felt an instinctive need to forage, and became agitated if he couldn’t. At night he rested quietly at their feet, stirring when wildlife shows came on television. He and the dog became companions. Years after Bolletje died, recordings of his barks brought Peter running. Of course, the Brassers knew Peter well, whereas I’ve only glimpsed semipalmated sandpipers. I can’t truly know what goes on their heads. Yet at some point this becomes irrelevant: we can’t ever really know what goes on in another person’s mind, but we manage all the same. I’m happy to know simply that the birds I’ve seen have their own private worlds, their own sense of light and companionship. They go to sleep expecting to wake again. Perhaps they have names for each other. I just don’t know what they are.